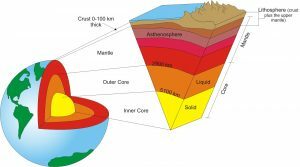 Lithosphere is the rigid, outermost layer of Earth. It consists of crust and uppermost mantle and lies above asthenosphere. The boundary between lithosphere and asthenosphere is derived based on the difference in their mechanical properties, and is generally associated with the isotherm of 1000ºC. There are two types of lithosphere, one being oceanic (found in the ocean basins, where oceanic crust exists) and less dense continental lithosphere (where continental crust occur). Lithosphere is divided into tectonic plates and a subfield of geophysics that includes studies of their motion and properties is called geodynamics.